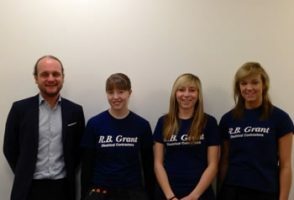 RB Grant Electrical Contractors is a long established family run business since 1974. Our reputation is earned from the professional service we offer through our fully qualified electricians. We insist on the highest of standards and this is demonstrated by our membership to approved bodies and the growth of our business during the past 44 years. Our clients range from home owners to large corporations, no job is too small or too large. So whatever your electrical needs are, you can trust RB Grant to provide a fast and efficient solution. Our electricians are based in St Andrews and Kirkcaldy carrying out electrical wiring installation, testing and maintenance all over Scotland. We supply a range of other services including Solar PV panels, MVHR, Fire Alarm, EV charging, CCTV & Data network installation. For a free quotation and design service contact the electricians you can rely on. 1/09/16 Girl Power……….the new generation!